I realized how little knowlegde seems available on that topic. Mounted and infantry archery are well know topics, but ships? They are moving platform like in mounted archery, you can stand like infantry and often there's some protection like in a fortress or siege situation. http://upload.wikimedia.org/wikipedia/commons...hugenu.jpg such as the repeating crossbow in Chinese naval warfare, part of the general role of crossbows in naval combat. http://graymonk.mu.nu/photographs/self_loading_bow/DSCF0038.JPG or a ballista(of the repeating variant) on a reconstructed Roman patrol boat in the Mainz ship museum. The issue here is that it shows how from early on very powerful ranged combat hardware was transported in a mobile role on ships and boats. I consider them in anti-personnel role as part of archery. In Hellenistic naval warfare reconstruction of multihull polyremes seems to be associated not only with increased reliance on boarding, but also archery and artillery to prepare for these attacks. It would likely be beneficial to include an overview on javelins and slings as they are part of that interplay of ranged combat from naval vessels.These are some examples of what could be themed naval archery. "The Great Warbow" has information from Mary Rose but you really should get the new two-volume set on Mary Rose--"Weapons of Warre". There probably is not a better resource for naval archery, though this was in the period of transition from archery to guns. MR still gives us the best information available for what was carried aboard a warship and represents the transition in arms. One of the reasons she sank is because she was designed in the early years of naval artillery and wasn't suited to the increasing number of guns Henry VIII stacked on her. Top heavy. Gun ports open. Turning hard. Goodbye. There are some very helpful 15th c. images. These show action including ship-to-ship fighting, landings, boarding parties, etc. The great thing about that variety is that we get to see tactics, arms in action and arms at rest for transportation. Notice the crow's nest bristling with javelins in one of the landing images. It's common to see both archers and javelineers in the topmast. 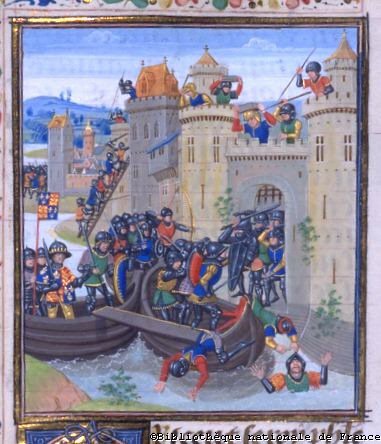 The Beauchamp Pageant image shown first below depicts a soldier dropping a large rock onto the opposition (he's going to want a refund on that breastplate). Using bags or bottles of stuff from bow and staff sling in the mid-13th century. This is a Scottish galeass in English service. 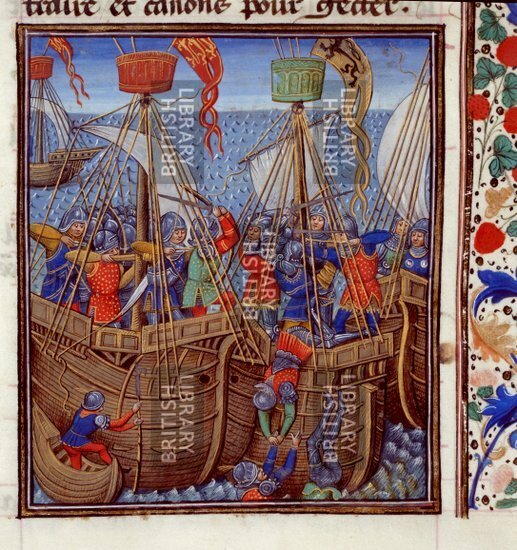 According to the Anthony Roll, the Scots have used very large installed crossbows on board . So far I missed any kind of these large anti-personnel weapons in the depictions. Were they rare or had the artists an opinion about what to exclude as negligible? It's one of my theories that for many people the crossbow replaced the javelin. 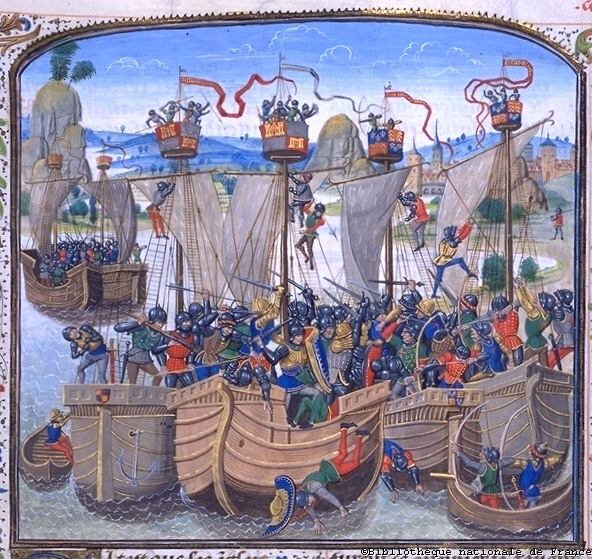 I wouldn't expect to find as many large bolt throwers on ships of an archery culture like England, but rather more on crossbow and javelin dominated ships in Genuese and French service. Venice would be interesting to know about. Lepanto would also seem to be a well documented naval battle with archery in use, at least from the Turkish side. You know a good source? So far I could find a prime emphasis on gunpowder artillery in the bow and boarding action. The many more galiots in Turkish service could have served as mobile archery platforms - in flanking maneuvers? You know a good source? A book I found at the library a few years ago, but unfortunately I forgot the name. The entire book was about the battle of Lepanto, discussing the differences in the Navies, some backround info, and a very detailed account of the battle. Unfortunately, the name escapes me. 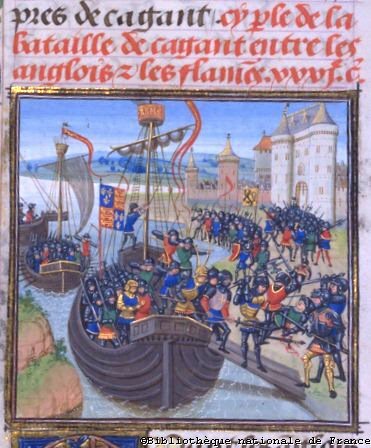 Foissart includes a few battles in some detail such as Sluys. Seems to start with missiles then close in fighting. Rocks, javelins and such seem to have been common. Southampton supplies warships with what seem to be minispears/javelins. 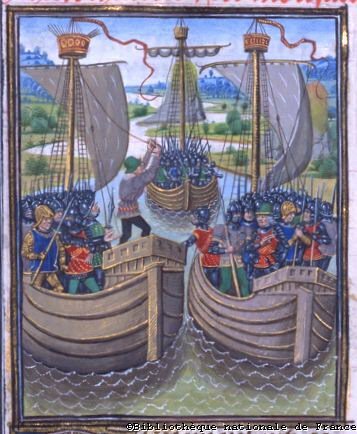 But if the fight is on shipboard, select two spears which are not to be thrown, one with a shaft long enough to reach easily from ship to ship and one with a shorter shaft, which you will find particularly serviceable when you try to board the enemy's ship. Various kinds of darts should be kept on ships, both heavy javelins and lighter ones. Try to strike your opponent's shield with a heavy javelin, and if the shield glides aside, attack him with a light javelin, unless you are able to reach him with a long-shafted spear. Fight on sea as on land with an even temper and with proper strokes only; and never waste your weapons by hurling them to no purpose. Weapons of many sorts may be used to advantage on shipboard, which one has no occasion to use on land, except in a fortress or castle. Longhandled scythes and long-shafted broadaxes, "war-beams "and staff slings, darts,: and missiles of every sort are serviceable on ships. Crossbows and longbows are useful as well as all other forms of shooting weapons; but coal and sulphur are, however, the most effective munitions of all that I have named. Caltrops cast in lead and good halberds are also effective weapons on shipboard. A tower joined to the mast will be serviceable along with these and many other defenses, as is also a beam cloven into four parts and set with prongs of hard steel, which is drawn up against the mast. A "prow-boar": with an ironclad snout is also useful in naval battles. But it is well for men to be carefully trained in handling these before they have to use them; for one knows neither the time nor the hour when he shall have to make use of any particular kind of weapons. But take good heed to collect as many types of weapons as possible, while you still have no need of them; for it is always a distinction to have good weapons, and, furthermore, they are a good possession in times of necessity when one has to use them. For a ship's defense the following arrangement is necessary: it should be fortified strongly with beams and logs built up into a high rampart, through which there should be four openings, each so large and wide that one or two men in full armor can leap through them; but outside and along the rampart on both sides of the ship there should he laid a level walk of planks to stand upon. This breastwork must be firmly and carefully braced so that it cannot be shaken though one leaps violently upon it. 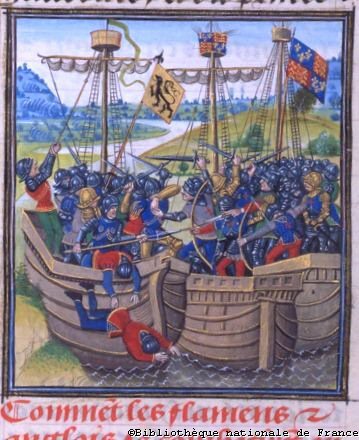 Wide shields and chain mail of every sort are good defensive weapons on shipboard; the chief protection, however, is the gambison made of soft linen thoroughly blackened, good helmets, and low caps of steel. There are many other weapons that can be used in naval fights, but it seems needless to discuss more than those which I have now enumerated. 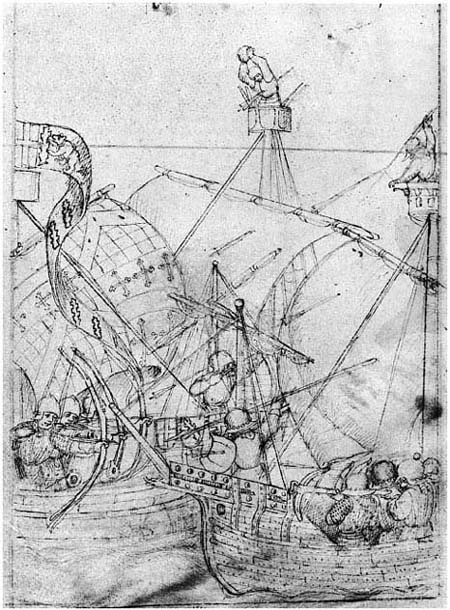 For a ship's defense the following arrangement is necessary: it should be fortified strongly with beams and logs built up into a high rampart, through which there should be four openings, each so large and wide that one or two men in full armor can leap through them; but outside and along the rampart on both sides of the ship there should he laid a level walk of planks to stand upon. This breastwork must be firmly and carefully braced so that it cannot be shaken though one leaps violently upon it. I'm not sure I properly understand that section. Is the ship built into a high rampart with a level walk all around? Kurt: Yes, that is the general idea. These are norse longship style ships, that do not have a lot of freeboard. Thus, it was common to prepare them for battle by building up the sides. The laws call for one bow for every second oar on the ship (With a 20 or 25 oars being a standard heavy warship), in adition to those brought by the crew as part of their personal equipment. The longhships where later to prove very woulnerable to the more modern kogs, with their higher freeboard that allowed the occupants to pepper the longship. The use of bows, crossbows, and hurled weapons of all kinds dominate norse sea battles. One of the identified battle sites from the 12th century (Fimreite) still has piles of large, oblong throwing rocks on the seabed. OK, I did never see an image of what such a prepared ship would look like. The German Hanse copied a lot from Norse culture, but had a preference for crossbows. They had a rowing boat and their cog as a team. Enemies were Slavo-Baltic in the Baltic sea with boats and bows. They had a problem against the high boarded ship and they were attacked by the mobile rowing boat of each cog. Concerning Denmark, a shift to larger ships in combination with horse transport was brought up elsewhere on this forum. Is there a similar shift in Norway with larger high boarded horse transport ships, lighter rowing boats for mobile combat (including pulling the heavy ship) and phased out remnants of the old infantry reliant leidang(these are the guys with the bow per oar) system with all on one fast low ship? We have a similar problem with the Turkish galiots at Lepanto, a lack of general information on small boats in naval battle. The only prominent role I can remember is for example the sea battle of Carthage in the Third Punic War and brief mentions of their existence during other occasions throughout time and across cultures. Main roles seem to be reinforcing or evacuating large warships. Additionally, they have a tradition as fireships, mentioned in this pre-Byzantine battle of Carthage above that sticks to their name until Napoleonic days. The notes from the Hanse don't make it clear what kind of troops were on the boat, but from the other information I'd deduce that they used them to deliver well-armoured close combat infantry that got rid of lots of lighter armoured pirates with bows on similar boats(or of the same people called pagans during the Nordic crusades). There's the use of low freeboard rowing boats for archers with bows or for charging with armoured close combat troops into the ranks of the archers (reminds me of the famous sea battle of Salamis with Greek hoplites, about which we also lack details except that there was lots of boarding action and not only ramming). 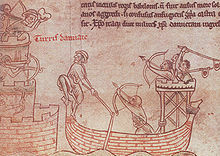 Crossbows and composite bows were used on even level by Venice and Genoa on their galleys. The Hanse uses crossbows from onboard their higher cogs and in the Mediterranean the use of crossbows or bows with arrow gliders supplants supplies for prior modes of archery in the administrative sources. According to Nicolle, this is related to the higher personnel efficiency of the hired professional crossbowmen in shipboard defence of high boarded transport ships. There are nice accounts of the safety offered by these ships and how crews from a fleet could evacuate there. I guess, we might find the crossbow and its archery as a component of a more professional fighter with an array of weapons(two handed axes, bills, short pikes) that similar to the zweihänder in naval combat(recently discussed on the forum) allowed to keep at bay multiple opponents and perhaps dispatch them with efficient ranged combat. So what do we know about the transition between different tools for ranged combat and their interrelation with ship types, combat modes and specialization/professionalism of troop types? You point to a very interesting part of naval history in Nordic waters and I'm not yet sure I fully understood it. After the Norway entered into joint kingdoms with Sweeden and Denmark, the norwegian military system was largely ignored, and the laws where not reformed. As a result, the Leidang stil consisted of longships untill the late middle ages. 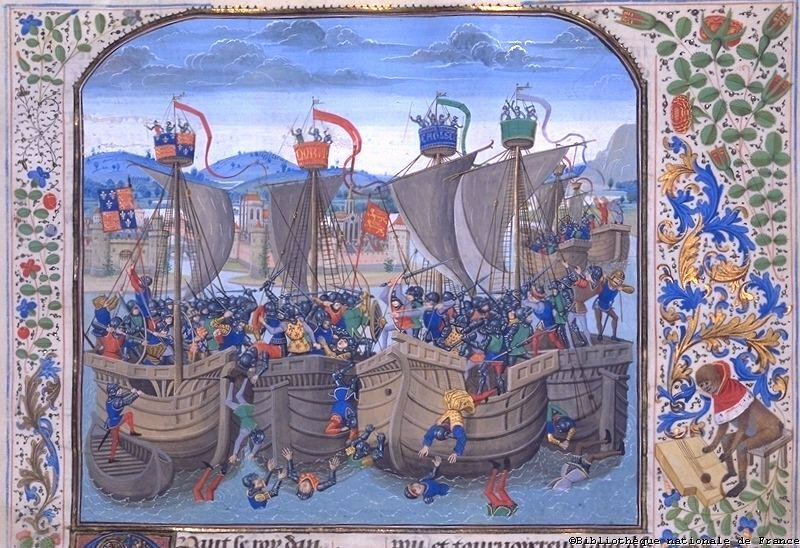 After a leidang fleet was defeated by the Victual Brother pirates in the early 1400's(! ), the system was finally abandoned, before being reformed into a milita army in the 17th century. And what did the Danes and Swedes do as they did engage into a number of naval conflicts? Naval archery probably differs so little from the methods used for shooting from land fortifications that I don't see why any separate manual or body of techniques would be required. Getting one's sea-legs might take some time but it's not really something that can be learned out of a written manual. There were few mobile fortresses in the Middle Ages that could outflank each other. 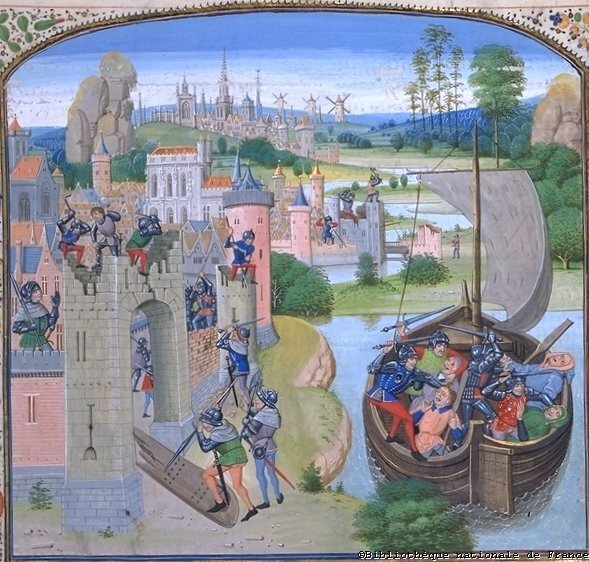 The Battle of Sluys has an interesting use of archers and men at arms for that purpose. You are probably right that the mundane job of shooting itself was very similar to what people did in a fortress. The difference is rather in the field how you organize shooting and for what purpose. It might be different. I've heard that sniping with a rifle downhill is more challenging than a horizontal shot. I don't know if that's true, but it does seem that there would be a learning curve for a man who's spent decades shooting on the flats and suddenly has to be shooting almost vertically from the topmast. Might not matter, given the closer range of naval targets. 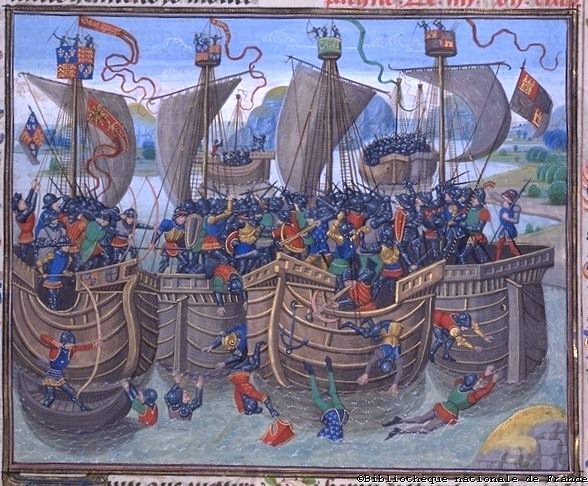 Several accounts of Sluys actually indicate some smaller ships were full of archers who would flank and pepper enemy vessels with arrows then leave. This way twice as many archers could focus on one enemy vessel and then go where it was needed when done. My guess is very much like a moving battle except instead of marching long distances the boats are moving. Balisticaly speaking, shooting up or down hill both change the point of impact. The dynamics behind this is a bit complicated, but the end result is that a projectile fired at an angle (up or down) will fall less than a projectile traveling the same distance flat. Of cource, a projectile fired from above will have a smaller "beaten zone" than one fired from below, and vice versa. Which is why cannon and machine guns are often placed at low points in the terrain, so that the projectiles can "rake" along the the ground.